The River Nidd is much smaller than the River Ure or River Wharfe, but has good fly fishing for brown trout and some grayling. Though not exactly small stream fly fishing, the River Nidd is a nice manageable size that responds to all fly fishing methods, but is quite overgrown in places. For some reason, and I don't know why, the River Nidd appears to carry more colour than other Yorkshire rivers. This is not a problem and probably helps us to deceive the trout and grayling of the Nidd that bit easier. The River Nidd starts its journey on Great Whernside and the surrounding hills, high above Nidderdale. Here the infant River Nidd flows through 3 upland lakes; Angram Reservoir, Scar House Reservoir (good fly fishing for wild brown trout - see the stillwater fly fishing page) and Gouthwaite Reservoir. These lakes tend to regulate the flow and protect the River Nidd from flooding following moderate rainfall, or particularly low flows in summer. Incidentally, Gouthwaite Reservoir is the only stillwater in England to contain grayling! The River Nidd goes on to join the River Ouse near York, a journey of over 30 miles. The River Nidd is a delightful little river, flowing through lovely countryside and is surrounded by many places of interest for the whole family, including the elegant spa town of Harrogate, Brimham Rocks (curious rock formations, long distance views and waymarked walks) and How Stein Gorge (limestone gorge, walkways and caves). Access to good fly fishing on the River Nidd is a little limited, certainly to the better areas, but I have access to the waters of Nidderdale Angling Club, probably the longest and best stretch on the river. Like most of the Yorkshire Dales rivers the River Nidd responds to most fly fishing methods, but I particularly like to fish the upstream nymph. The River Nidd, for most of its length in Upper Nidderdale, flows below a tree canopy, making casting upstream almost obligatory. A cast across stream usually ends up with your flies hanging from tree branches. This combined with the peat stained, fast flowing water, makes the upstream nymph my method of choice for fly fishing on the River Nidd, unless the trout and grayling are rising well. As with most Yorkshire Dales rivers, winter grayling fly fishing is not what it was, with numbers much reduced over recent years. The River Nidd has long been one of my favourite Yorkshire Dales Rivers for fly fishing. It feels a little different in character to the rivers Ure and Wharfe and it is certainly less well known, even by the locals. I like to use the River Nidd if it is windy because it is shrouded with trees (mainly alder) giving it a high degree of shelter. The River Nidd can be very good in places and not so good in others. If you are visiting the Yorkshire Dales for fly fishing your time will be precious and you don't want to waste your time in the wrong area. I know the River Nidd very well, having fished it extensively for years, and I can take you straight to the best fly fishing areas and target the trout or the grayling depending upon season or your preference. For example, one lady that I took to the Nidd on the first day of her fly fishing holiday with her husband said to me "I just want to catch one grayling before we go home at the end of the week" . By lunchtime she had caught 8 grayling and 1 trout! Nidderdale is designated an AONB (Area of Outstanding Natural Beauty). Pateley Bridge is the focal point of the Dale, with many quaint shops and a lovely recreation park on the banks of the River Nidd. Pateley Bridge is also home to the Nidderdale Agricultural Show each September. Country shows are part of Dales life and make a great day out for the whole family. 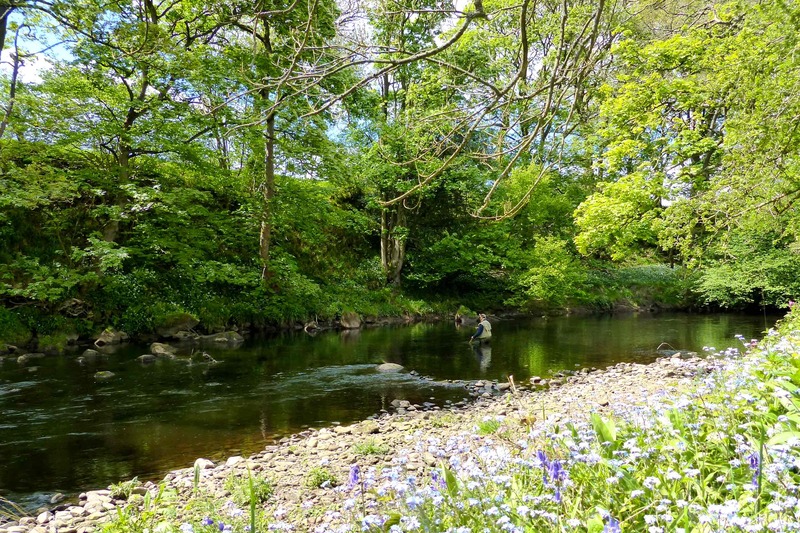 There aren't many angling clubs on the River Nidd that offer day tickets but Nidderdale Angling Club has extensive fishing with much of it available on day tickets.